Every once in a while, for whatever reason, old songs/artists that you haven’t heard from in a long time, reemerge out of the blue and all of a sudden you start hearing them and seeing them wherever you go. I’ve been hearing Alanis Morissette songs on the radio a lot lately and oddly enough soon after that she became a guest vocal coach on the hit singing TV show, The Voice. Isn’t that ironic? Don’t you think? In particular, I’ve been hearing her song “Ironic” from her Grammy for Album of the Year winning album, “Jagged Little Pill”. Which I also ironically enough listened to in the last month (before I started hearing her on the radio again and before she ever popped up on The Voice) because I was building up to last months Grammy Awards by listened to every Grammy winning album for Album of the Year, save a few that I couldn’t get via Spotify and/or didn’t own myself. A little toooooo ironic. Yeah, I really do think. So today’s song of the day is, what do you know, Alanis Morissette’s “Ironic”. This entry was posted in Music, Song Of The Day, Video and tagged 54th Grammy Awards, Alanis Morissette, Album of the Year, Grammy, Ironic, Jagged Little Pill, Music, Song Of The Day, Spotify, The Grammy Awards, The Voice, Video. Bookmark the permalink. Over the next 5 day’s I will be sharing my 5 favorite performaces from this years Grammys. Today I bring you Bruno Mars’, “Runaway Baby”. He always puts on a great, well polished performance with lots of style and energy. I love how he is very obviously doing an ode to Elvis, one of his idols and a has a quick little James Brown moment too. He really get’s the crowd off of their, as he puts it “rich a$$es” and love the bullhorn part. Such a cool performance!!! Bruno is such a talented guy and he’ll definitely go very far if he keeps at it like he has been the last 2 years. I know it was hard for him to lose all his awards to Adele, but he’ll definitely get them next time because he’s got the goods and this was just Adele’s year. But this is Bruno Mar’s performance. The only video I was able to find of the performance is a little poor in quality, but it does the job. Enjoy. This entry was posted in Music, Song Of The Day, Video and tagged 54th Grammy Awards, Adele, Bruno Mars, Elvis, Grammy, Grammy's, James Brown, Music, Runaway Baby, Song Of The Day, The Grammy Awards, Video. Bookmark the permalink. So last night was the 54th Grammy Awards and I have to say it was a great show!!! Lots of great performances, although I could have done without a Chris Brown performance, not to mention two of them and a win for him for best R&B Album. Also Nicki Minaj went way over the top in the most weird and unoriginal way possible. Her performance was a jab at the Catholic Church. Like that hasn’t been done before by Madonna and Lady Gaga. It was just weird for weirds sake. It may have been visually flashy, but was just done for shock value with no real depth or artistic value. Other than those few negative moments, I can’t really complain with how it went. Some of the great performances of the night, came to you via Bruno Mars, Adele, Jennifer Hudson, Coldplay & Rihanna, Glen Campbell, Foo Fighters and Paul McCartney (twice!!!). All the big winners were deserving. 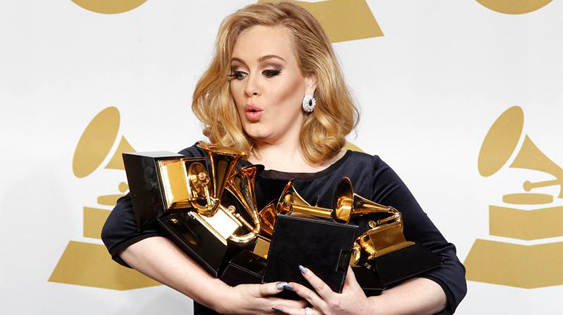 And by winners I mainly mean Adele, because she walked away with just about every major award. She took home 6 awards in total, including the big award of the night, Album of the Year, as I predicted. It was pretty obvious that, that would happen. Also Bon Iver took home the award for Best New Artist, as I also predicted. LL Cool J was the first host that the Grammys has had in many years and he did a great job. He began the evening leading a group prayer for Whitney Houston. Later in the evening, Jennifer Hudson performed a beautiful and moving tribute to Whitney Houston, as well. The only thing that was really missing from the night was a tribute to Amy Winehouse and the inclusion of Don Cornelius in the tribute montage for those that have passed away in the past year. However it was a very memorable night and of the nominees, the people who most deserved it, won for a change. The Grammys had been kind of losing me in recent years with poor choices for winners and weak overall shows, but they won me back this year. I can’t wait for next year!!! It’s MY Superbowl!!! This entry was posted in Music, News and tagged 54th Grammy Awards, Abbey Road, Adele, Album of the Year, Amy Winehouse, Best New Artist, Bon Iver, Bruno Mars, Chris Brown, Coldplay, Don Cornel, Foo Fighters, Glen Campbell, Grammy, Grammy's, Jennifer Hudson, Lady Gaga, LL Cool J, Madonna, Music, News, Nicki Minaj, Paul McCartney, R&B, Rihanna, The End, The Grammy Awards, Whitney Houston. Bookmark the permalink. It has just been announced that Whitney Houston has passed away at the age of 48. There is no news on the cause of her death, yet. She was considered by many (including myself) to be one of the greatest female voices of all time. Her first album was released in 1985 and in her 27 year career she has accumulated somewhere around 415 awards, making her the most awarded female artist of all time. Her album/soundtrack for the movie “The Bodyguard” won Grammy for Album of the Year in 1994. She’s also the 15th all time, best selling artist in the world. Some of her most memorable hits include “Greatest Love of All”, “I Wanna Dance with Somebody (Who Loves Me)”, “I Will Always Love You” and many more. We will always love YOU, Whitney. Rest in peace. This entry was posted in Death, Music, News and tagged Death, Grammy, Grammy's, Greatest Love of All, I Wanna Dance with Somebody (Who Loves Me), I Will Always Love You, Music, R.I.P., The Bodyguard, The Grammy Awards, Whitney Houston. Bookmark the permalink.